For the longest times, chaise lounges have been something you typically only encountered in luxury settings. These days are thankfully over and you can score one for under $100. Chaise lounges have become a more and more frequent sight in gardens, at pool-sides, on terraces, in lounges and front-rooms, and -most notably- in a bed-room setting. While still not common per se, those lovely pieces of furniture have irrevocably taken up residence in the lives and homes of people like you and me. Now, you might ask yourself what is a chaise lounge exactly? A chaise lounge, or chaise, is basically a sofa that has resulted out of a combination of a chair and a footstool. It usually comes with a high, slanted back and enough room to stretch out comfortably. An arm-rest is possible, and the classic chaises generally do have them, but it cannot necessarily be considered a defining feature. As a whole, chaise lounges are perfect for reading and unwinding, and are typically found as relaxing sun loungers, comfortable add-ons to sectional sofas, and luxurious recliners in spacious bedrooms these days. In other words, chaise lounges are the perfect furniture to lay back and just let yourself enjoy (a good book, a glass of wine, the vista, lovely company, deep conversation, peaceful silence,…). And the good news is, that you can afford to indulge yourself and have this spot of luxury in your life – for a very reasonably price! 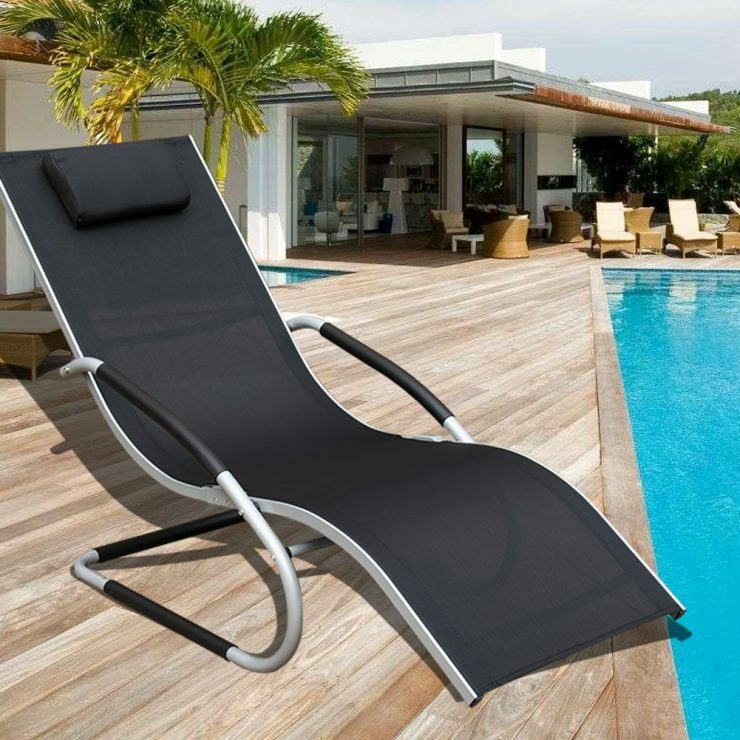 We have collected some of the best chaise lounges (both indoor and outdoor) for under 100$ on the market for you below. The only question remaining is which one you’ll chose! Chaise lounges, by their very nature, are the perfect seating for sun-lovers. Thanks to their slanted back and wide leg-room they are perfect for comfortably basking in the summer heat without having to switch position every few minutes to combat getting a crick in the neck while trying to read or work on a deckchair, to shift away from stones that you haven’t even noticed when you spread your blanket out in the grass, or to get rid of the annoying ants that have decided you are just another surmountable obstacle in their path. Typically, you will want to settle for comfortably cushioned chaise lounges if you plan on using them somewhere in your back garden or on your patio, and will want to choose something plainer (simple wood or webbing) when you plan on lounging on it after a dip in the pool. The Rema Wave wood chaise by Coral Coast is made out of beautiful acacia wood and has a lovely dark brown finish. It is perfectly suited for relaxing at the pool and enjoying a good book or a lazy nap while you dry off. 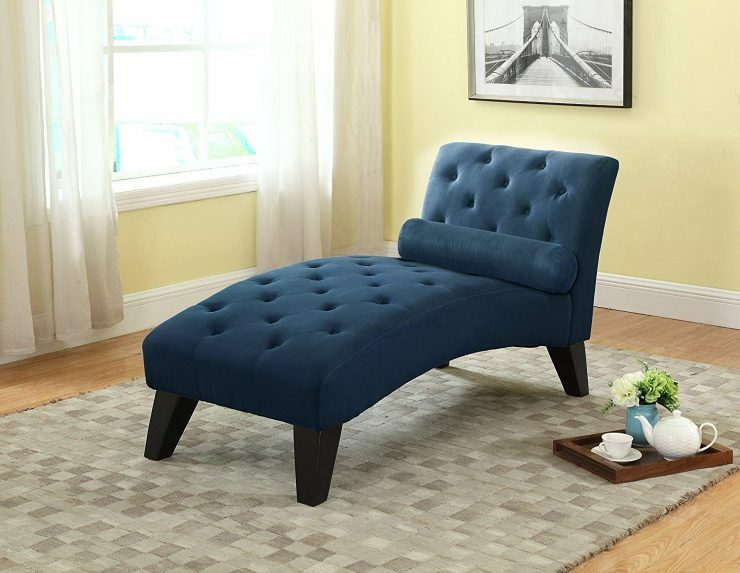 The adjustable chaise by Otterbein is one of those pieces of furniture you can’t help but fall in love with the moment you first sit down on it. Made from durable aluminium and with a PVC mesh fabric, this chaise lounge meets your every outdoor need. The back can be adjusted to five different positions, and the legs of the bottom most part can be folded in, giving you a whopping 10 different combinations to choose from to find your perfect reclining position. The Outdoor Deluxe chaise by Sundale is the best you can get in terms of style vs. price ratio. 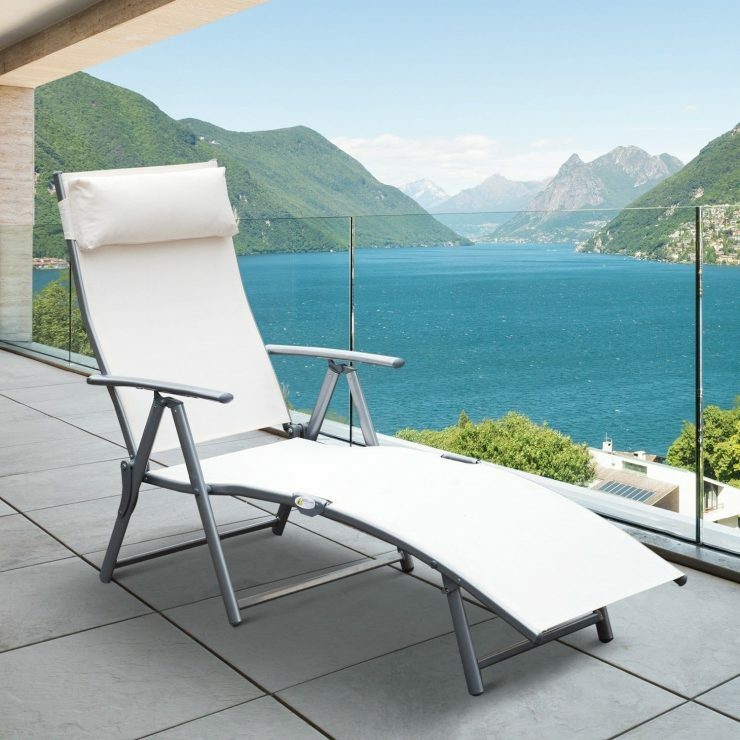 With its stylish aluminium frame and the classic mesh fabric cover this chaise will be your favourite spot to sunbath in no time at all. The Rocking Wave chaise by Ware combines the best of two worlds – the unmatched comfort of a chaise lounge and the soothing motion of a rocking chair. This comfortable rocking chaise effortlessly brings a touch of contemporary sleekness to your porch, garden, or pool-side. The Alexa Square chaise lounge by Mainstay is the perfect addition for your patio. 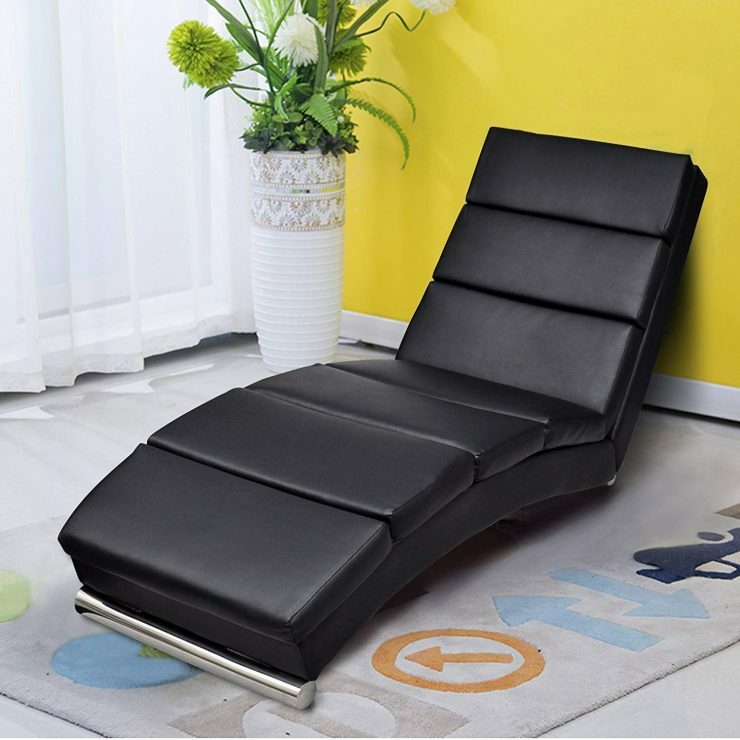 The comfortable chaise comes with a delicate leave design on the steel frame, four different back-rest positions, and a comfortable seat cushion and lumbar pillow. 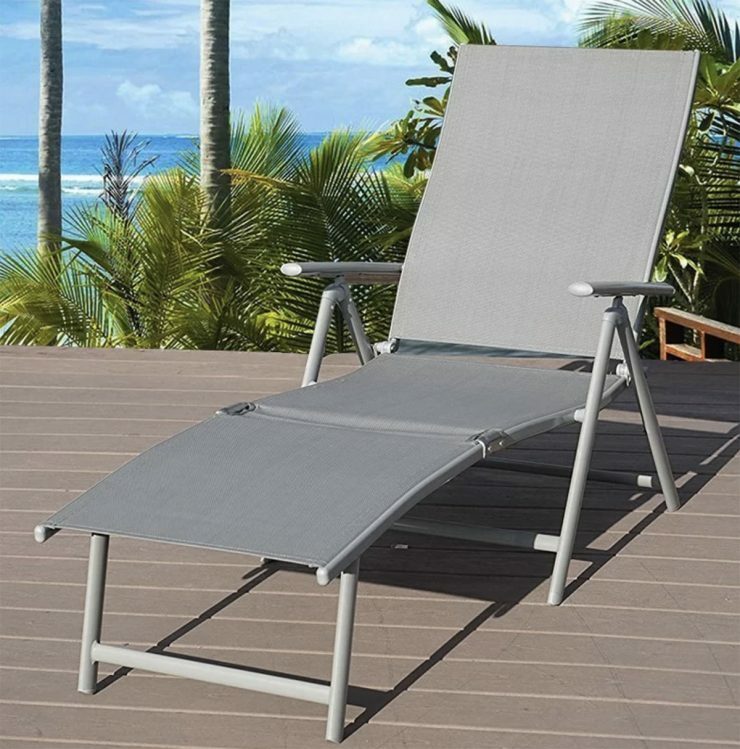 The lightweight Outdoors Chaise Lounge by Outsunny is perfect for long, lazy afternoons in the sun. 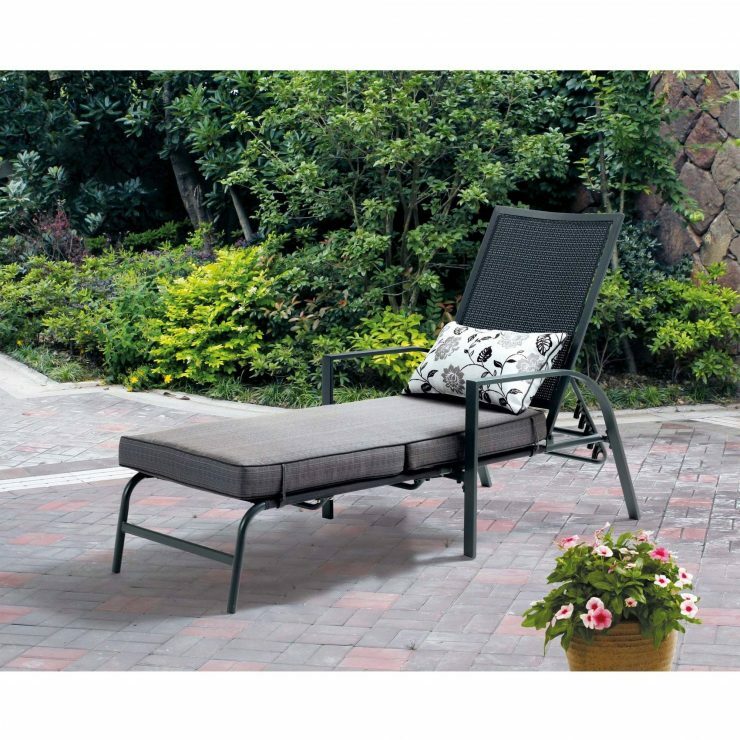 The sturdy steel frame is durable and easily withstands heavy-duty use, the mesh sling fabric is weather-resistant and can be easily left out all summer long without doing damage to stability or comfort (even though the chaise is both foldable and very light, allowing for easy transport). 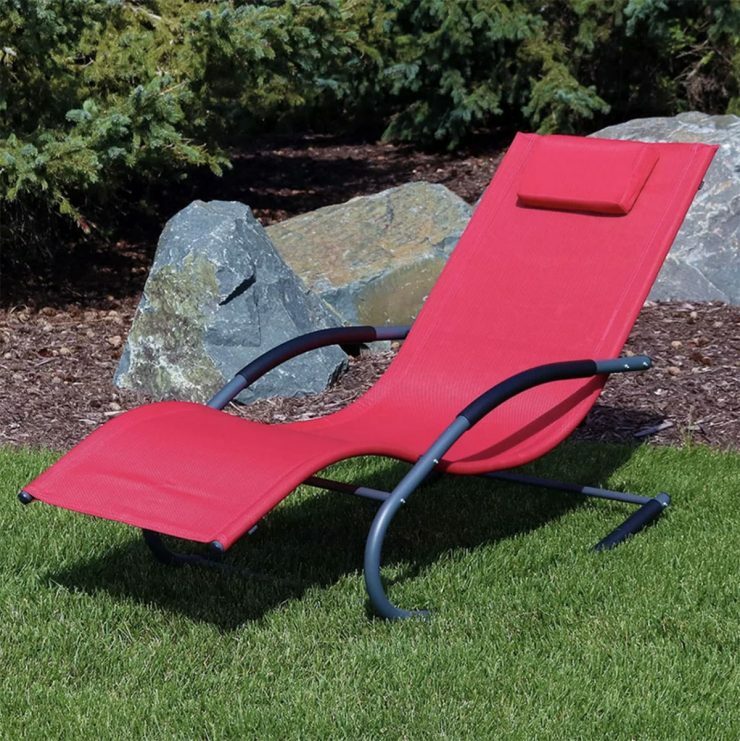 The sturdy chaise lounge chair is a great addition for your patio or garden. 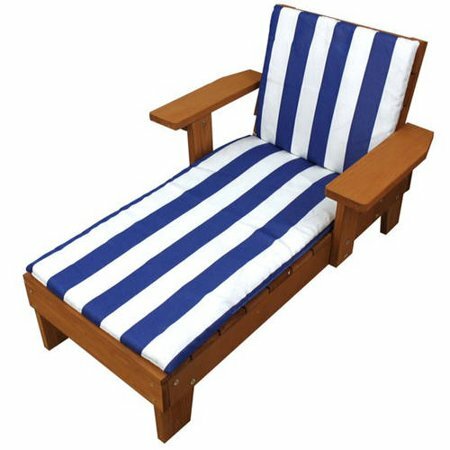 With its blue-and-white cushions the wooden chaise conjures up visions of a mediterranean sea-side resort, and the extra wide arm-rests are perfect for keeping a cool drink close at hand. Simply relaxing! Just as the name suggests, the Beach chaise lounge by Grand Patio is your perfect companion for a sunny day at the pool. 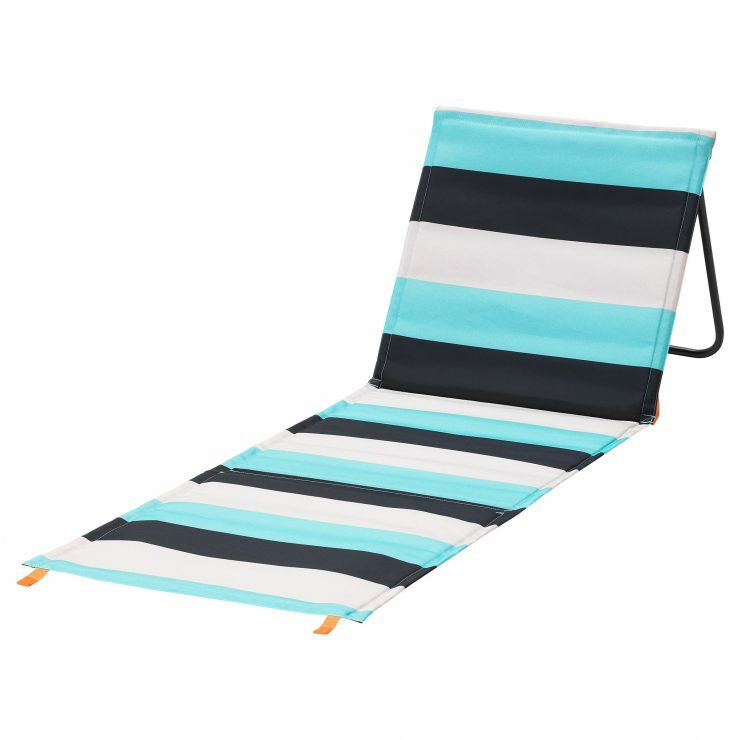 It comes with an integrated awning that helps keep the sun off your face (which comes in incredibly handy if you’re reading) if needed and can simply be folded down if not. Additionally you can chose between lying completely flat and three more upright back positions, which makes finding the perfect position for any circumstance as easy as can be. And last, but not least, the very handy Sommar 2018 by IKEA. While not a “real” chaise lounge, this option is a winner when it comes to price and portability. 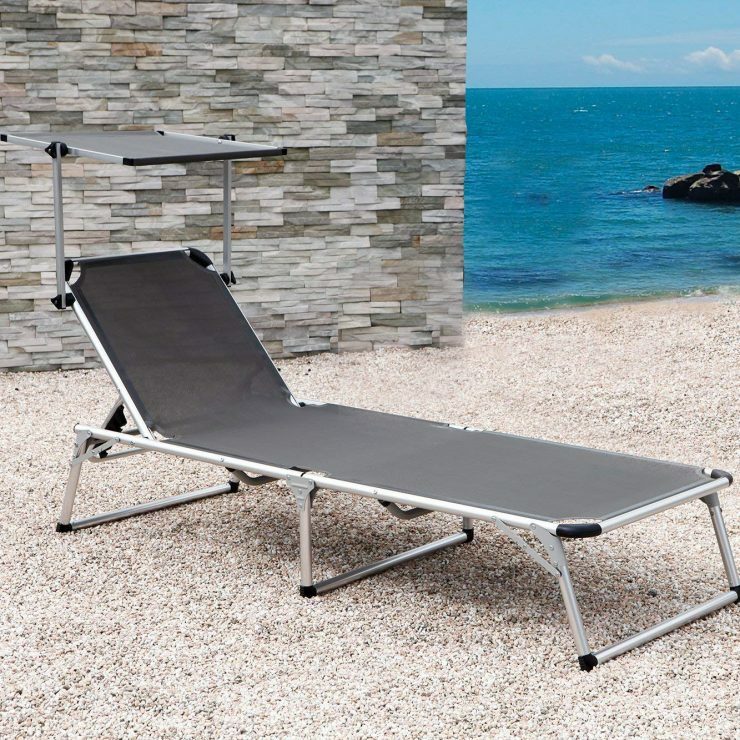 If you’re unsure if a chaise might be something you enjoy having on your patio, or if you’re looking for something you can easily take along to the beach, the Sommar 2018 is exactly what you’re looking for! What once has been a highly coveted luxury item in upper-class and noble homes has finally made its way into “regular” living spaces as well! Chaise lounge add-ons are particularly well-loved additions to sectional sofas, though there is a vast array of simply stunning stand-alone pieces of furniture to be had as well. In your living room, a chaise will add additional seating space and the perfect spot to relax in front of the TV, in your bedroom the chaise will add a touch of luxury and comfort and provide a highly coveted lounging space besides your bed. While staying under $100 for an indoor chaise lounge limits the available options drastically, there are always some hot deals waiting to be discovered! Cloud Mountain’s Leisure chaise is a lovely piece of furniture that will fit in with nearly any living-room or bedroom design. The black faux-leather upholstery rests on a sturdy steel frame and moulds itself to your body perfectly. DHP’s Emily Linen chaise is a stunningly beautiful, yet minimalist piece of furniture. 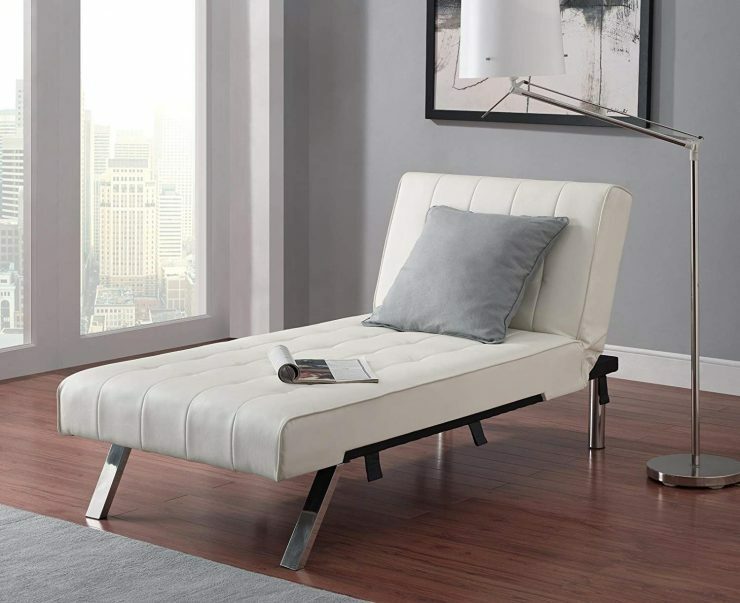 With its creamy-white faux leather upholstery and the stylish chrome legs, this chaise will be a much beloved addition in your living-room or bedroom. What’s more – the backrest can be laid completely flat, making the chaise lounge the perfect solution if you need to make space to have a friend or family member stay for the night. The Mila chaise lounge by NHI Express mirrors the traditional style of this classic piece of furniture. With its royal blue tufted upholstery and the dark wooden legs, this chaise is as much a pleasure to look at as it is comfortable.